Birdseye Maple is 6% harder than White Oak. Birdseye maple isn't a separate variety or species of sugar maple, but rather a figuring phenomenon of unknown cause that occurs within that species as well as in several other species of tree as well. It is distinguished by a distinctive pattern in the wood resembling tiny, swirling eyes within the smooth lines of grain. When Maple lumber is graded, the majority of the brown heartwood and the white sapwood are separated. Small amounts of Birdseye Maple are naturally found and separated out for its premium price. This page describes the type of flooring with with birdseye figuring only, as regular Maple is treated like a separate species. Please refer to the Curly Maple flooring properties page for more information on other Maple grades. Birdseye Maple is a highly sought-after Maple product in any grade. Select and Better Birdseye Maple flooring comprises white and pink sapwood. The Maple is less sorted for color than it is for its dotted Birdseye figure, but is usually fairly consistent in color. No knots or mineral streaks are allowed in this grade. 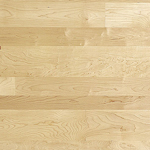 #1 Common Birdseye Maple flooring contains some character, such as dime-sized knots, as well as mineral streaks. #2 Common Birdseye Maple flooring includes all the character found in the wood. Large knots, white and pink sapwood, dark heartwood, worm holes, and other surface defects are included in this grade. Other common names are Rustic Birdseye Maple, Mill Run Birdseye Maple, and Tavern and Cabin Grade Birdseye Maple.